Your itinerary includes some good beach time at LAZY B BEACH CLUB and Tyre Beach. Attractions like Al-Shouf Cedar Nature Reserve and Iris Beach Club Damour make great kid-friendly stops. There's still lots to do: take a stroll through Beirut Souks, Head underground at Jeita Grotto, examine the collection at Mim Museum - Mineral Museum, and take an in-depth tour of National Museum of Beirut. To find other places to visit, maps, ratings, and tourist information, use the Beirut trip planner. Cairo, Egypt to Beirut is an approximately 2-hour flight. You can also drive. In September in Beirut, expect temperatures between 36°C during the day and 28°C at night. Finish your sightseeing early on the 11th (Tue) to allow enough time to drive to Baalbeck. 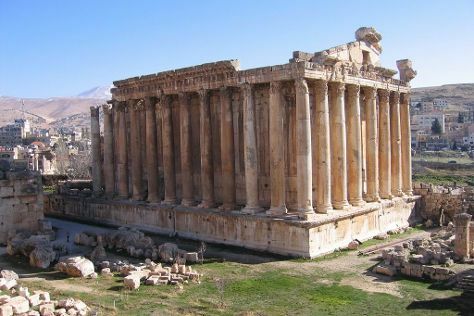 Start off your visit on the 12th (Wed): get to know the fascinating history of Baalbek Roman Ruins and then explore the ancient world of Temples of Baalbek. To see reviews, where to stay, and more tourist information, read Baalbeck road trip planner . Drive from Beirut to Baalbeck in 1.5 hours. September in Baalbeck sees daily highs of 36°C and lows of 28°C at night. Wrap up your sightseeing by early afternoon on the 12th (Wed) to allow time for travel back home.